She is certified by the Texas State Board of Dental Examiners in Pit & Fissure Sealant Application and Nitrous Oxide Sedation. In addition, she is CPR certified by the American Heart Association. Carla enjoys spending time with her family and taking her pit bull out for fun adventures. Some of her favorite hobbies include hiking with her dog, swimming, and dancing. 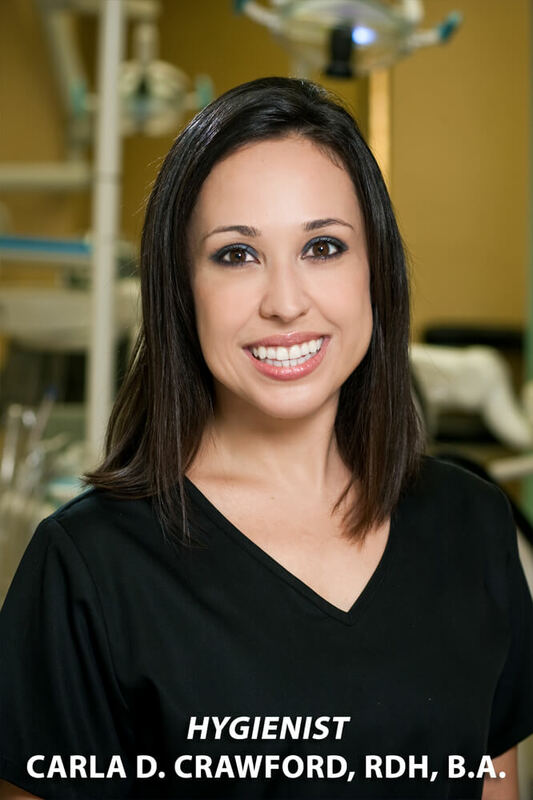 Nydia has developed an interest in dental hygiene and how it relates to dental implants. She is a certified dental hygienist for implants. She received her certification from the University of Texas Health Science Center Dental School Implant Preceptorship Course. While she finished up her dental hygiene degree in San Antonio she earned the Outstanding Clinician Award, awarded to students who have excelled during dental hygiene school. Nydia is certified in Pit and Fissure Sealant Application and has met all the requirements set forth in State Board of Dental Examiners Rule 115.2(2) and is authorized to monitor the admission of Nitrous oxide/oxygen inhalation conscious sedation. She is also CPR certified from the American Heart Association. Nydia enjoys hobbies such as scuba diving, traveling, and spending time with her husband and children. Nydia and her husband, Bob Weathers, are very active with the Washington Birthday Celebration Association. She presently serves as an active member of the WBCA Board of Directors and on the Board of the Society of Martha Washington. While in dental hygiene school, she was one of four dental hygiene students selected to serve the Laredo community during rotation in order to help patients, practice improve her clinical skills in the field. It was always important for Gabriela to be an excellent student, she made it to graduation with honors and respect from the dental community. Her dream has always been to return to Laredo to become a part of her community’s dental society and work alongside her family. A huge motivation for Gabriela as a dental hygienist is being able to educate her patients by sharing the knowledge she acquired during her years as a student, knowing that it can save smiles and prevent oral disease. She also participated in many events being part of the American Dental Association and the Texas Dental Hygienists’ Association. 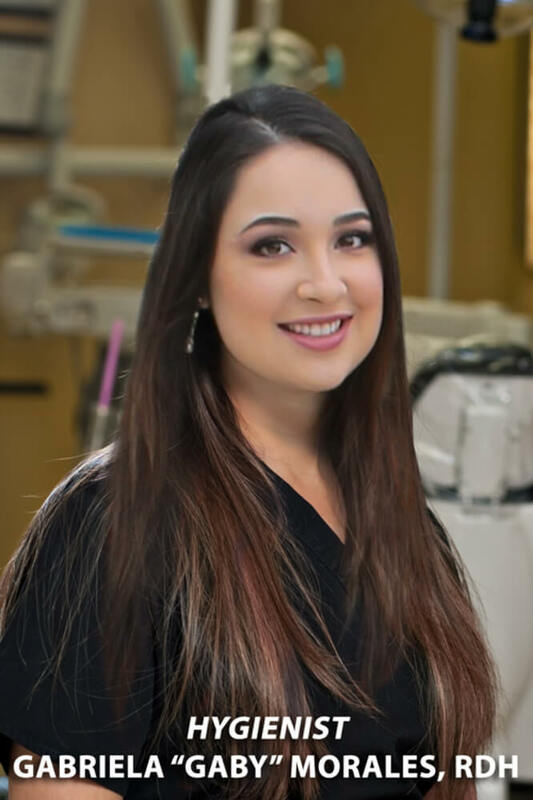 Besides being a dental hygienist, Gabriela likes to spend time with her family and friends, some of her favorite things to do include dancing, cooking, and traveling. 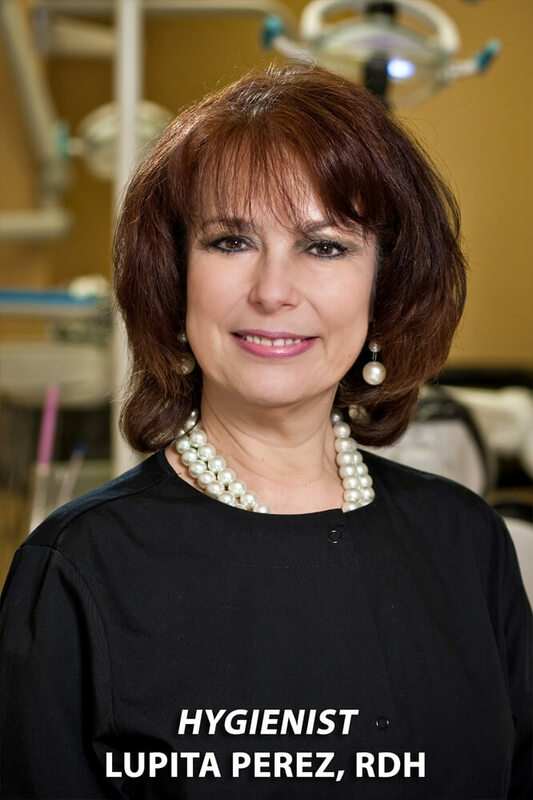 Lupita Perez, RDH, enjoys the distinction of being the first Laredoan to have graduated from dental hygiene school located in the Houston Science Center in 1975. Currently, Lupita, who is someone with many interests, is a full-time employee with United Independent High School where she serves as a Public School Administrator. She graciously serves as a part-time dental hygienist with Gentle Family Dentistry of Laredo working for three days, late in the afternoon. Lupita’s vast dental hygiene experience includes working full-time for the Dental Department of Laredo-Webb County Public Health Department where she treated adults, children with emphasis on oral hygiene instruction, and the implementation of a patient recall system. She also was involved with elementary school children in the Laredo Independent School District through the L.I.S.D. Nursing Department. Lupita has also provided dental hygiene services in various private dental offices in Laredo during Spring Breaks, Thanksgiving Holidays, Christmas Holidays and Summer vacations. She has also kept her dental hygiene credentials current by dental hygiene duties and working with U.I.S.D. elementary schools during career day with dental hygiene presentations. Lupita is, in addition to all she does, completing her Ph.D with Texas A&M University at College Station. Lupita enjoys spending time with her husband, Juan Luis and her sons, when she finds the time.